Himalayan Dog Chews are made out of yak. Got a dog with allergies, that can't have traditional chews like rawhide and bully sticks? Give them yak instead. Yakkity yak. I love yaks. 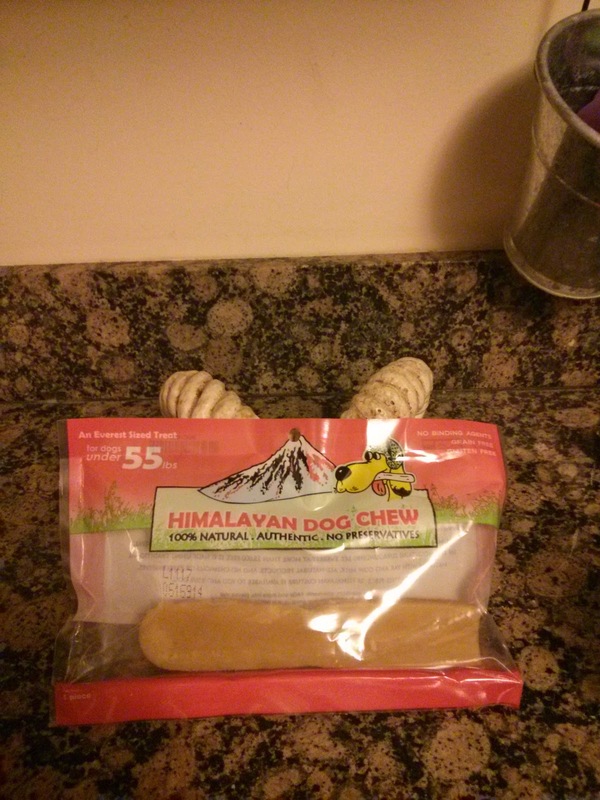 The people at the Himalayan Dog Chew company also love yaks, so no yaks were harmed in the making of this edible chew. The Himalayan Dog Chew was developed from a recipe for a yak cheese snack made by people in the Himalayas, where yaks are the backbone of human society. Seriously, traditionally people there ate yaks and yak milk, and made clothes, tools, and tents out of yak parts. They even have yak races. With decorated yaks. I swear I am not making this up. The first time I got a Himalayan Dog Chew for Brisbane was about eight years ago, when I first spotted them in a store. I brought it home and handed it to him, and he devoured it within minutes. I thought it was a pretty huge waste of money. Still, I thought I'd give them another try, and I'm glad I did. I gave them to Brisbane and Ulysses and ten minutes later I saw that they weren't chewing and assumed they had already gobbled down their yak. Ten minutes after that I saw them both chewing again, they had each hidden their yak chews for safekeeping. While I keep the yak chews picked up most of the time, they have yet to finish them even when left all day long in a crate with nothing but yak for entertainment. Even Ru loves his yak chew. These occupy a unique space on the chewing spectrum for my dogs, they are higher value than a rawhideor antler and lower than a bully stick, they also last longer than a bully but not as long as a rawhide or antler. Good For: Lasting days longer than a bully stick or venison crepe around here. Being novel enough that dogs with massive allergies can still enjoy them. Being totally digestible. Not Good For: Dogs that like to swallow things whole. Dogs with dairy allergies. How Much We Like Them: I want to say we will always have them around, but the truth is that they still haven't finished the first ones I gave them. The package says to microwave the small end pieces so that they puff. I am ridiculously excited to see this happen, I just wish they'd finish the damned things so I can nuke them.